Happy New Year from all of us here at Twin Eagles Wilderness School! No, it is not January 1st, but it is the end of our annual cycle here at Twin Eagles! With late summer comes the end of our summer camps, and the end of our eighth year holding true to our vision of deep nature connection mentoring. We're grateful for a phenomenal summer camp season, out biggest yet with a 35% percent increase in enrollment, from 125 kids last summer to 170 kids this summer! From 4 year olds learning to pick a saskatoon for the first time, to 8 year olds discovering the ancient wisdom and rapture of being a nature ninja, to 12 year olds igniting their passion with friction fire, to 16 year olds discovering a deep sense of self confidence and power through a 24 hour wilderness survival quest, many hearts are full with the teachings of the earth from this past summer. We're also thankful for all the support we received this past year continuing our classic nature connection programs in addition to launching three new programs: the Art of Mentoring, a boy's Rite of Passage (marking the entrance into adolescence), as well as our re-designed nine month long transformational Twin Eagles Wilderness Immersion Program. We were so proud to graduate 100% of our students in the program this past June! Looking ahead to the school year, we'll be offering a variety of youth programs (watch for our registration announcement coming soon! ), our second annual Art of Mentoring workshop extravaganza for adults and youth, the Twin Eagles Wilderness Immersion Program, and a number of other programs throughout the year. This summer I've seen more poison ivy around than any year before. I found it more abundant in the normal spots, and present in places I would have never suspected. When it comes to hazards in the natural world, it is so important to dispel the myths and learn the facts. 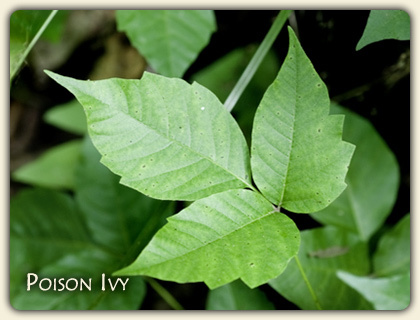 Learn to identify the poison ivy plant, prevention, treatment, and discover a holistic perspective on poison ivy. Take the time to learn about this potentially hazardous plant before you run into it! One of the core principles we live by here at Twin Eagles is living life to the fullest. There is a simple practice we impart on our students of imagining yourself at the end of your life, looking back. "What did you do with your life? Did you go for it, giving it every ounce of passion you could muster? Or did you let it drift away?" Graduates emerge on the other side with a living rope of connection to the Earth alive in their bones. With deep ties to a community of like minded people. With a deep sense of self, an appreciation and clarity of their own gifts, and a path forward towards a sustainable and regenerative future for the full ecosystem of planet Earth. Twin Eagles Wilderness Immersion Program 2013-2014 begins September 25. We still have some available spaces left. If you feel a pull towards this as a possibility for yourself or someone else, discover more about the journey here. The Inland Northwest Art of Mentoring 2013! Monday, October 7 - Saturday, October 12, 2013 · Sandpoint, ID · For Ages 3 - 103! Deep in all of our roots, there are stories of our ancestors living in healthy, regenerative communities — villages where people of all ages were in deep relationship with the land, each other, and themselves. The Art of Mentoring is a six day, experiential, nature based set of concurrent programs for ages 3 - 103 designed to help us remember these old ways and learn to apply them to our modern communities. We at Twin Eagles are proud and excited to be bringing the Art of Mentoring to the Inland Northwest for the second year in a row this coming Fall! This workshop is one of several Art of Mentoring workshops currently being offered around the world. We bring together a team of experienced leaders and facilitators from around our bio region and beyond to staff five concurrent programs that will co-create a joyful, engaged learning community. Learn more about the Art of Mentoring here! 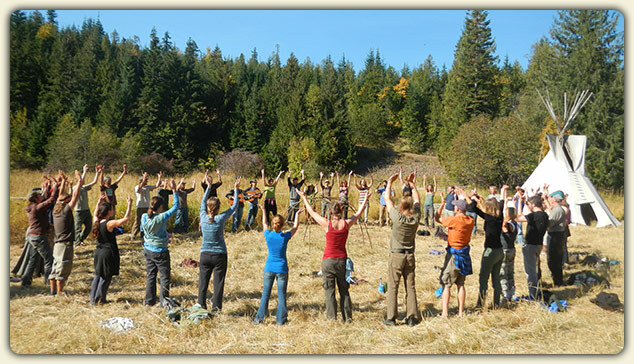 Inland Northwest Permaculture Convergence 2013! Hundreds of people exploring pathways to a positive future! The third annual Inland Northwest Permaculture Convergence features hundreds of topics, dozens of presenters, workshops, round tables, permaculturists from around the Inland Northwest, a trade show, music, plant walks, swimming, tasty home grown nutrient dense food, and children's activities! Permaculture is about restoring local economies and local ecosystems, resilient communities and great gardens, natural building, renewable energy, water harvesting, sharing information, having fun!, Care of land, Care of People, and Fair Share! Twin Eagles will be well represented at this years Inland Northwest Permaculture Convergence, with our staff offering both adult presentations as well as youth programs. Put simply, if you care about the Earth and our future, this gathering is worth attending! 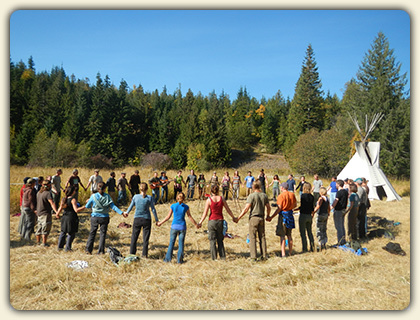 Learn more about the Inland Northwest Permaculture Convergence 2013 here! Thanks for reading, and blessings to you this late summer season.